The movie gets off to a really slow start and I was bored at first, but along the way it picked up steam and became not only interesting but comical. This is once again another movie with HUGH racial undertones. “The Best of Enemies” is no “Green Book”. 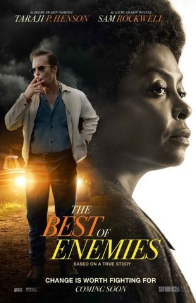 In fact the best elements of “The Best of Enemies” is Taraji P. Henson and Sam Rockwell. They both turn in excellent performances, but you will remember Taraji P.
The paid critics were ‘Luke-Warm” about “The Best of Enemies”. I think it’s worth a look.